There is an odd concept in Scottish politics that things that are paid for by someone else are free. The SNP in particular has based much of its populism on providing these “freebies” to their supporters. We now have “free” prescriptions, “free” eye tests, “free” passage over the sea to Skye and of course most famously “free” tuition. 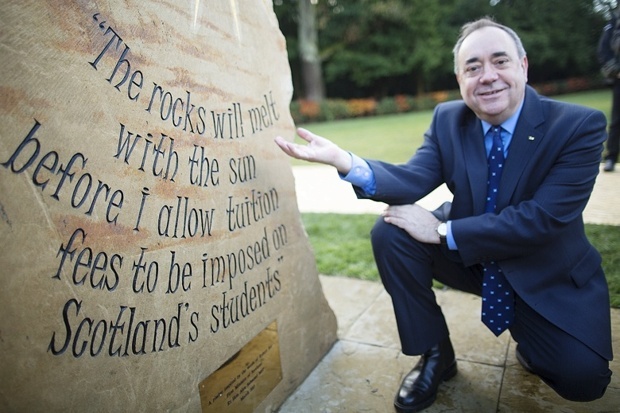 Mr Salmond has promised that rocks will melt before he will allow unfree tuition, though quite how he will be able to forever stop these rocks melting now that he no longer even has a seat in the Scottish Parliament is unclear. Can Mr Salmond’s hubris guarantee permanent SNP Government? But of course none of these things is free. They are all paid for by taxation. Who pays for taxation? Well I do and you do. The shops we go to pay tax and we pay tax on nearly everything we buy. How much of what I earn in the end goes to the Government? This is something they deliberately make obscure. There are so many different taxes: Income Tax, National Insurance, VAT, Council Tax, tax on savings. But how much does it all add up to? According to the latest Index of Economic Freedom “The overall tax burden equals 32.9 percent of total domestic income.” This means that on average everyone in the UK pays nearly 33% of their income in tax. Some people pay considerably more than this, some pay considerable less. But none of us get anything from the Government for free. In the university where I work it is typical for people who should know better to consider that everything should be free. Nothing must get in the way of academics getting as much as possible from the Government. There must be no nasty considerations about what something costs. Efficiency is considered to be a rather unpleasant word and nearly everyone votes for a party that considers higher public spending to be the solution to everything that is wrong with the world. Perhaps it is for this reason that we have reached the stage where staff are routinely not replaced and where we have a brand new expensive library that cannot afford to buy books. The funding model of universities in Scotland is broken. It is the SNP that broke it. We have two classes of students, those who pay fees and those who don’t. The fee payers come from England, Wales, Northern Ireland and the rest of the world except the EU. Those who have “free” education are from Scotland and the EU. Naturally this means that we have a large number of EU students. There is a lot to be said for people from all over the world coming to Scotland to study. It makes for an interesting mix and when these people return home they speak fluent English and have knowledge of life in Scotland. In the long run this helps trade. But as a matter of university economics it is preposterous to provide these people with free education. University education is expensive. Every Scot and EU student who studies for “free” costs the Scottish tax payer. That means you and me. In many if not most cases a university will make a loss from educating these people. Sometimes in the case of medicine degrees the cost to the university versus the fees received is such that the loss is enormous. It costs hundreds of thousands to train a doctor, but the tuition is “free”. Who pays? We all do except the doctor who then demands to be paid as if he were running a top company that makes millions. Given that the university is not making a profit from its Scottish and EU students how does it remain in business? It does so by charging foreign students. By foreign I mean non-Scottish and non-EU. What this means is that every fee paying foreign unit from China, Africa, England, Wales and Northern Ireland is subsidising the education of non-foreign students from Scotland, France, Germany and so on. Imagine that there was a pub in Edinburgh which charged people from Scotland, Italy France and so on zero pounds per pint, but charged people from England, Wales, Northern Ireland and China ten pounds per pint. The reason for the price differential was that Scots wanted to drink for free and being fair minded they couldn’t bear that this wouldn’t apply to other Europeans, except of course the English who can’t really be called Europeans at all given their attitude to Brexit. Would you consider this pub to have a fair system of pricing? Moreover, if you were English would you go to this pub? This situation also means that Scottish universities have to discriminate against Scottish students. The subsidy that Scottish students receive from English students means that it is far easier to get into one of the top Scottish universities if you are English. Only the foreign fee paying units help our universities to balance their books, so if there are not enough one year they will choose foreigners over Scots. One of the benefits of Brexit for Scotland is that we will no longer have to give EU students “free” tuition at Scottish universities. Scottish tax payers will no longer be burdened with paying for people who may not contribute to the Scottish economy. It is folly to pay hundreds of thousands of pounds to train a doctor only for him to return to Spain. Moreover, few indeed are the Scottish students who receive a similar benefit from studying for free in the EU. How many Scots are doing degrees at the University of Warsaw? How many EU languages do you speak to a level at which you could study at university? Perversely however the SNP are planning to keep paying the fees of EU students even after they no longer have to. We all know that Mr Swinney is a very nice man. We know that the SNP are keen to portray themselves as good Europeans, but the Scottish economy is in deficit to quite a considerable extent. We should not be spending tax payers’ money when we don’t have to. The whole system of “free this and “free that” in Scotland is founded on a lie. It is not free. Moreover it is isn’t even Scots who pay. The only way that our economy isn’t bust is because every year we receive billions of pounds from the UK Government. People in other parts of the UK then are paying Scotland to have “free” services that they themselves can’t afford. The parents of an English student are in fact paying twice. They are subsidising the Scottish student through general taxation and they are then subsidising him because their child has to pay the fees that enable the Scot to study for free. This is usually described as beggar they neighbour economics. Discriminating against your fellow British citizen because of where he comes from is obviously wrong. While treating him as if he were a foreigner at the same time as you treat other foreigners as if they were from Scotland is grossly unfair. Why do the SNP dislike people from other parts of the UK so much? It couldn’t possibly be xenophobia could it? Using Scottish taxation to fund foreign students when you don’t have to and when you are running Scotland at a loss is mismanagement. The SNP are using a divide and rule strategy. It is as if they want people in the rest of the UK to say “Good riddance”. This might be their greatest chance of achieving independence. Why would Scots vote against such a cosy arrangement? Nothing is free. There is always a cost. The cost of SNP folly over education is that our universities are becoming second rate and our system of “freebies” depends on taxes we don’t ourselves raise and discrimination against those who do. Amazing what can be afforded when you won't be paying for nuclear weapons. An independent Scotland will prioritise health and education. So that explains why the SNP government is not currently prioritising health and education in its spending plans and why they have run down the medical budget compared with other national administrations within the UK? It must be all the fault of a project which has barely started and on which very little has yet been spent. Another sep numpty displays their considerable intellectual limitations. "when you won't be paying for nuclear weapons"
Being committed to NATO means spending about 2% of GDP on defence, the UK currently spends about that amount. Assuming iScotland wishes to remain in the NATO alliance, where in your mind does this saving come from given the same proportion will be spent on defending iScotland as is spent on the defence of the UK? ....and discrimination against the English. The English are our friends and neighbours - not our masters! When I look at Scotland I do not see any friends of the English. Thats says more about you than anything or anyone else. Oh no, it's about you Scots. Anglophobia is almost the definition of what it is to be Scottish. You define yourselves by how non-English you can be. It' sad really. That isn't true of all Scots but it certainly defines SNP supporters despite their manic protestations to the contrary. After all, why would they wish not for real independence (pro-EU membership to the extent of supporting the single currency etc and effectively becoming a satelite/vassal state of Germany/province of the EU) but secession from a United Kingdom they have done so much to create and make successful and where they have a bigger role than they would ever have in the EU and here's the clincher their ultra-soft attitudes to mass immigration? The capital cost of replacing Trident is estimated at £30-40 billion by the MoD. The "overall cost" (included in-service operating costs) is estimated at £167 billion by Reuters (according to this Guardian article) and £205 billion according to the CND (a figure which includes running costs to 2060). So if we take the largest possible available figure of £205 billion provided by CND, Scotland's 8.2% population share of that would be £17bn. That's spread over 45 years, so works out at £370m a year or £74 per head of population. Now, an independent Scotland would lose the additional funding of £1200 per head from the Barnett formula and of course have to finance our £15 billion deficit and £140 billion debt and presumably we'd have to have our own defence force estimated to cost around £3-5 billion a year. Looking at these figures the loss of the Barnett money would cost £6 billion and an additional Scottish defence cost of £3 billion every year no doubt to be paid for out of additional taxation and swinging cuts to services ( including health and education)....... and that doesn't even take account of the deficit. It's amazing what we wouldn't be able to do being independent and free of Nuclear weapon costs, don't you think ? Still, could be worse. A country could have a national debt of £1.6 Trillion and not raise tax - but that wouldn't happen, would it? How much do we save by no longer contributing to UK costs....like the 3Bn that we notionally get charged for defence....Is the UK debt not today financed by Scottish taxes ? Do we somehow have to pay double for being uppity Scots ? The deficit happened on the Unionist watch, its financed today and somehow its an unsurmountable hurdle for Scotland. This argument is so poor that people in the future will have difficulty even understanding it. Thats without even questioning the whole nonsense about the size of scale of the 'Scottish' deficit...Something that is somehow magically just cherry picked over the last few years following a level of fiscal mismanagement in London not seen out side of a war.